Here’s something a little different than you typical lawn-related or green-industry related posts that I hope you enjoy … the theme is Lawn-Related Children’s Books! 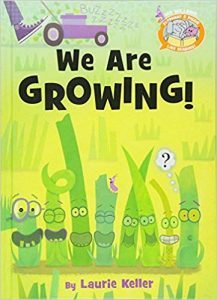 Last Summer, when visiting Black River Books in South Haven, Michigan, I happened across a cute lawn-related children’s book that put a big smile on my face called We Are Growing! by Michigan Author and Illustrator, Laurie Keller, as part of the great Mo Willems’ Elephant & Piggie Like Reading! series. You can even watch a Youtube video of the author, Laurie Keller, reading We Are Growing as a part of the Adventures in Michigan kids’ summer reading program at Baker Book House — HERE IT IS! K-Gr 2—An exciting thing is happening. The grass is growing! One blade grows tall, another grows curly, and two grow pointy. As these changes occur, the blades of grass declare what it is that makes them unique—all but one, that is. The last blade of grass has no distinguishing feature of note, and no matter how much the group wrack their brains, they can’t figure it out. Then, the great equalizer, the lawn mower, comes along. It takes this event for the blade to discover his special quality. As for the rest, even though they are literally cut down, they are reassured that they will grow again. The empowering narrative can be applied to lessons regarding things like confidence, identity, and growing up. No matter the takeaway, the message is easily consumable, thanks to exaggerated characteristics, cartoonish actions, and a good sense of comedic timing. In this new series, Willems’s popular characters share their favorite books, acting as the introductory and closing framework to the story. In this case, they have made an excellent choice. VERDICT Fans of Elephant and Piggie will devour this kooky easy reader, with its similar presentation and storytelling style. We Are Growing! got me wondering what other kids’ books I might be able to find that are lawn-related, so here are 5 more books (of MANY that are out there) for kids of all ages that you might enjoy sharing with the young ones in your life. 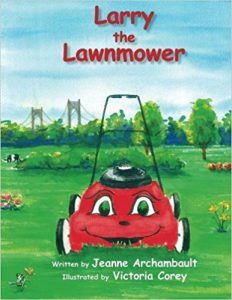 Larry the Lawnmower by Jeanne Archambault and illustrated by Victoria Corey, (2014). 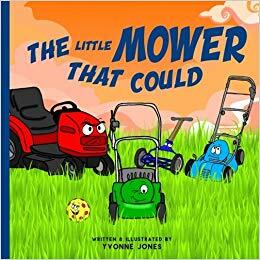 In this Mom’s Choice Award-winning picture book, Larry is a dedicated little lawnmower, but when a big blue rider-mower replaces Larry on the farm, he is no longer needed and ends up being left in the shed until a young boy finds him and gives Larry a coat of fresh red paint so they can mow lawns together to earn money so the boy can buy a new bike. This story was inspired by Jeane Archambault’s grandson who was “crazy for lawnmowers” starting at 2 years old, and the illustrations are based on scenes at Windmist Farm in Jamestown, RI on Conanicut Island, where both the author and illustrator call home. 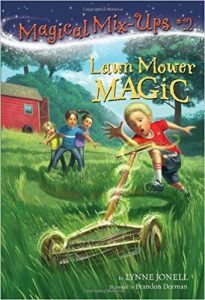 Lawn Mower Magic (A Stepping Stone Book) by Lynne Jonell, illustrated by Brandon Dorman. This illustrated chapter book is actually a sequel to Hamster Magic, and continues to follow the four Willow children as they have recently moved to an older home in the country. The family’s lawn mower breaks down and they can’t afford to fix or replace it, so the children dig out an older push mower that was stored in an hold tool shed. The mower doesn’t look like much, and it’s difficult to use, but it turns out that it’s been soaking up magic for years, and it’s hungry for grass. The children accidentally discover that the mower will move on its own, and the more it mows, the faster it goes. Just like what happened with the hamster in the first book in this series, there’s some type of magic happening. Louie the Lawnmower series by Maria I. Morgan, illustrated by Sherrie Molitor. 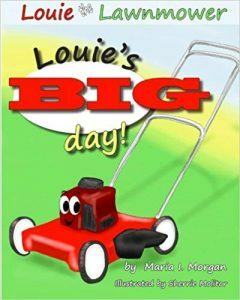 In this series of 3 picture books written by Christian inspirational writer and speaker, Maria I. Morgan, Louie is a bright red lawnmower who previously lived with this friends at a hardware store. Louie’s BIG Day! (2014), Louie & the Leaf Pile (2015), and Louie to the Rescue: The Big Dig (2017) are fun, cute, simple stories that don’t overtly talk about God or Christianity, but the themes and life lessons like sticking up for your friends, getting to know a person without judgement, and being careful with your words are ones that the author feels helps her to “share God’s truth and make an eternal difference.” Any of these 3 books can be read as a standalone story. Lawn Boy (2009) and Lawn Boy Returns (2011) by Gary Paulsen. Gary Paulsen is one of America’s most popular writers for young adults, and has written more than 200 excellent books for young adults. His his 5 book Hatchet series is especially well-known. 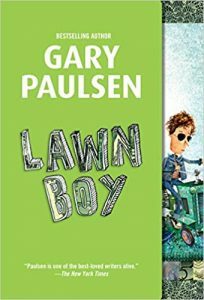 Lawn Boy and Lawn Boy Returns are short light-hearted chapter books that tell about the comical slapstick adventures that unfold when a 12 year old unnamed narrator who is broke and decides to earn some money by using his Grandfather’s old riding lawn mower that he received as a birthday gift. When one of the boy’s customers, a persuasive day-trader Arnold Howell, barters mowing services for market investing advice on how to make money, humorous and increasingly complex economic adventures unfold as the business expands into an empire. Paulsen gives young readers a thorough yet entertaining crash course in basic economics and business concepts, such as the stock market and the changing needs of growing business enterprises through the lens of a lawn mowing business. What a pain in the crabgrass! When is time to apply a pre-emergent crabgrass preventer? So we never have an “exact” date on when to apply the crabgrass pre-emergent since every season is different. We monitor the weather and soil temperatures. Crabgrass germinates when the soil temperatures are consistently 60° F degrees for 3-5 days at a 1/4″ level. To be effective, crabgrass pre-emergent must be applied at least 2 weeks prior to germination. Here’s a great (real time) link we use for crabgrass germination and optimum times to apply pre-emergent from Michigan State University. GDD Tracker. 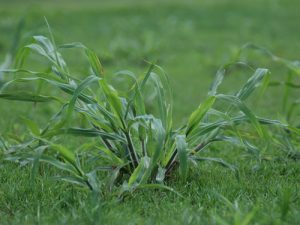 As you may know, the best crabgrass prevention is a dense, healthy turf, but because crabgrass has a massive reproductive & survival capability, it is common to have some in your lawn. Some of you may have seen more crabgrass come up several weeks after your first application last year. Here’s a tip: To prevent that second flush, simply apply another crabgrass pre-emergent to your lawn 7 weeks after the first treatment. Regular fertilization should help thicken turf along with proper watering and mowing. Water deeply and infrequently. (Light and shallow watering will encourage crabgrass growth). Do not mow more than 1/3 of the leaf blade at one time. If you mow below 2.5-3 inches (depending on the turf species) it will increase crabgrass populations. IMPORTANT TO KNOW: If you are planning on seeding or have completed a dormant winter seeding, we do not recommend using a crabgrass pre-emergent until the new seedlings grow (at least 2 mows at 3 inches high). If you apply it too soon, it will likely end up killing any new grass seedling growth. There are a few options for crabgrass treatment if you have planted grass seed or plan on planting this spring. For example, a very effective product that Red Hen Turf Farm carries is a selective herbicide called Tenacity. Tenacity herbicide can be used for pre- and post-emergence control of a wide range broadleaf weed and grass species, including CRABGRASS (well, up to the point where the crabgrass has 4 tillers or fewer). 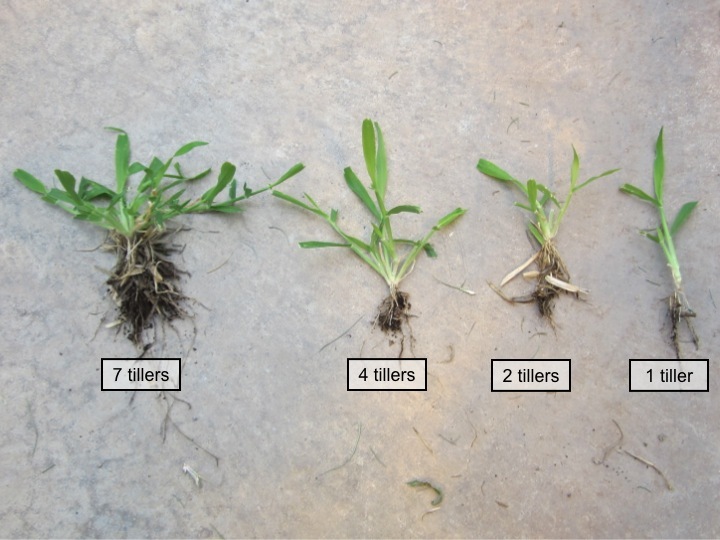 Here is a picture to show the tillering stages of crabgrass. Tenacity’s active ingredient, mesotrione, which is based on a naturally occurring compound produced by the bottlebrush plant that inhibits photosynthesis in susceptible plant species. The mesotrione is absorbed by weeds you are targeting through the roots, shoots and leaves and distributed throughout the plant by “translocation“. Becuase the targeted weeds are blocked from using photosynthesis, it does turn the targeted weeds white, and it may also cause temporary whitening of your turfgrass (for a few weeks anyhow). Tenacity does NOT contain any fertilizer, so if this is the herbicide you choose, you’ll likely want to also do a non-herbicide / straight fertilizer application (like our 25-0-5 fertilizer) in May. When properly applied, Tenacity will destroy the weed but not harm your grass. And it’s safe to use on established or newly seeded turf. Just give us a call and we can go over the products to use. Use caution when using post emergent herbicides and ALWAYS read the label. 574-232-6811 is the number to call. Pick your battles. You shouldn’t plant grass seed AND apply crabgrass pre-emergent at the same time. If crabgrass was a problem for you last year and you want to treat it, apply the crabgrass pre-emergent and save your seeding for fall. That is the best time to seed anyway. (Typically around August 15-September 15 … again, every year is a bit different … Purdue explains more about seeding in their free publication – CLICK HERE). Know when to give up. Crabgrass can be a pain if it is not taken care of early enough. If you wait until summer and you realize your crabgrass is out of control, you may as well let it go until it dies off with the first frost. There are post emergent herbicides that you can use but they are more difficult to use than the pre-emergent products, they cannot be used in the heat of the summer, are expensive, and are only effective on smaller crabgrass plants – which you probably don’t see anyway. If you are looking for crabgrass pre-emergent + fertilizer (13-0-5), come see us! We have quality fertilizer in stock at great prices AND you get free expert advice! Don’t forget to visit us on Facebook to see all of our updates including office hours and our first harvest of the season! We have a ton of crabgrass topics! 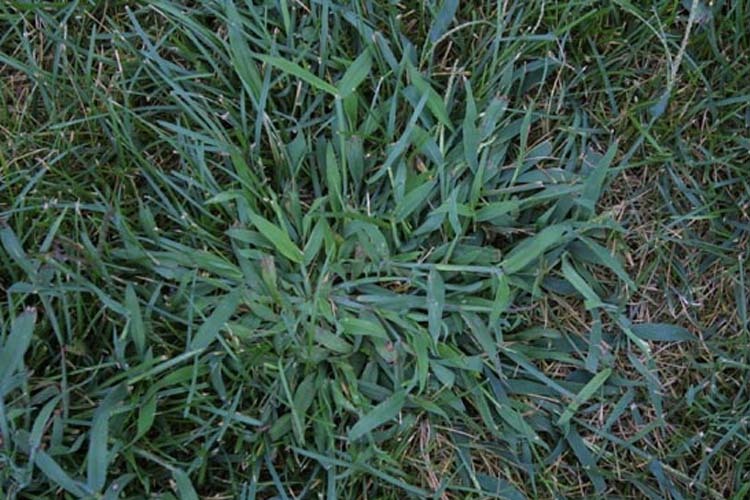 Check out our previous blog posts that touch on the topic of CRABGRASS by CLICKING HERE.